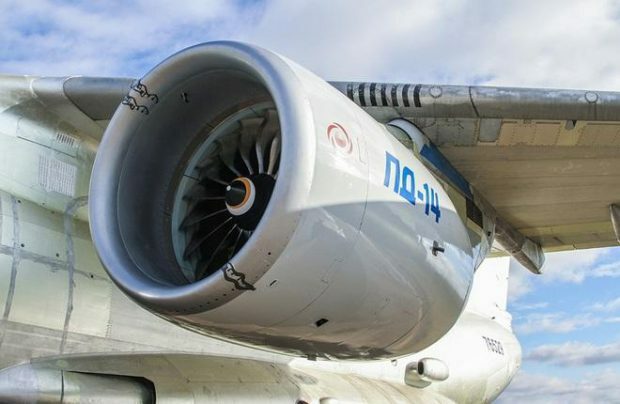 Russia’s Aviadvigatel PD-14 engine program has entered the third phase of flight tests, United Engine Corporation (UEC) reports. The phase is intended for verifying the results of the previous, pre-certification test flights, after which the Federal Air Transport Agency is expected to issue a type certificate for the powerplant. A single production-compliant flying prototype is undergoing trials on an Ilyushin Il-76LL testbed at Zhukovsky-based Gromov Flight Research Institute. Russian certification is expectetd in 2018, to be followed by EASA validation in 2019. The previous two flight-testing phases continued from 2015 to 2017. The prototype performed as advertised across the powerplant’s operational envelope of altitudes, airspeeds, and thrust settings. Ground trials continue in parallel with the flight testing program. The PD-14 is designed as an engine option for Russia’s future Irkut MC-21 narrowbody. In the second half of 2017, a scale model of the MC-21-300 variant with PD-14 nacelles underwent wind-tunnel tests at Central Aerohydrodynamic Institute (TsAGI) to assess its aerodynamic performance. UEC says the PD-14 offers performance on a par with contemporary Western-built equivalents, and might even surpass them in some respects, such as noise and emissions.